Not to mention mag shields equipped everywhere, AIR performs light weight reduction ashamed by its name. thinned to the limit (about 10 g weight reduction compared with 14 moon beautiful 2004 spool). creative engine plate shining crimson proof of AIR. performance is mounted on both ends of the handle shaft. No matter how excellent rotation performance it is, it will be meaningless unless it lasts long. The advantage that the initial performance lasts for a long period of time is that the more you use it in the harsh Saltwater scene for Lille, the longer the longer you hold it, the stronger you will feel. lure during retrieval are more easily discriminated. The air rotor also features not only lightness but also high strength. The arch structure of the air rotor distributes the load in a well-balanced manner, and can maintain high strength with less mass. SW scenes where 1.5 lb and 2 lb are becoming mainstream now, the adoption of ATD which is friendly to fine threads is an overwhelming advantage. By the appearance of this drag, it is easy to prevent the line break even in the schedule of the sudden rake and the ruler meval. Moreover, even unexpected mouth break of weak fish like horse mackerel can be kept to a minimum. 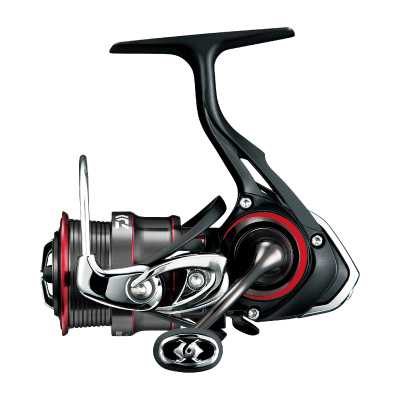 It is a level that is not an exaggeration to say that "Finesse drag of the highest in Daiwa history" is its capability. It is a carbon resin with carbon fiber woven into high density, and if it is in the same weight ratio, the rigidity (flexural modulus) is not less than magnesium known as ultra light metal. Furthermore, being strong in "rust" because it is a carbon resin is a great merit that can not be imitated by metals. It is no exaggeration to say that it is just "a material born to become a reel". A small signal from underwater, which is felt because it boasts high rigidity while being lightweight. Its high sensitivity becomes a powerful weapon with light SW scene, which is increasingly becoming lighter and more sensitive to tackle. Thin aluminum spool In order to lighten the spool even 1 g, we achieved weight saving not to be ashamed of the name of "AIR"
attached) and can not even blank (drill) . winding surface inversely tapered with a large diameter, the line ahead of the spool is hard to be pushed out, the line trouble starting with the backlash drastically decreases. Large caliber spool also contributes to improve winding speed and drag performance. ABS R is designed exclusively for fluoro line.